Fait Accompli is French for “Accomplished Fact,” an expression that is spoken to describe a process that is too late to change. A bold and appropriate description of Bis’ presence in the Hip-Hop world and of the album’s 17-track looking glass perspective of the contemporaneous world. “It’s too late to change.” The album is focused on a reverse image of the Western world’s economic and social paradigm which stands boldly in stark contrast to the mainstream narrative. It depicts an impersonal and detached illustration of a dangerous end game of economic and social hazard through dystopian and prophetic imagery, but this time with a hint of indifference to the listener’s interpretation. 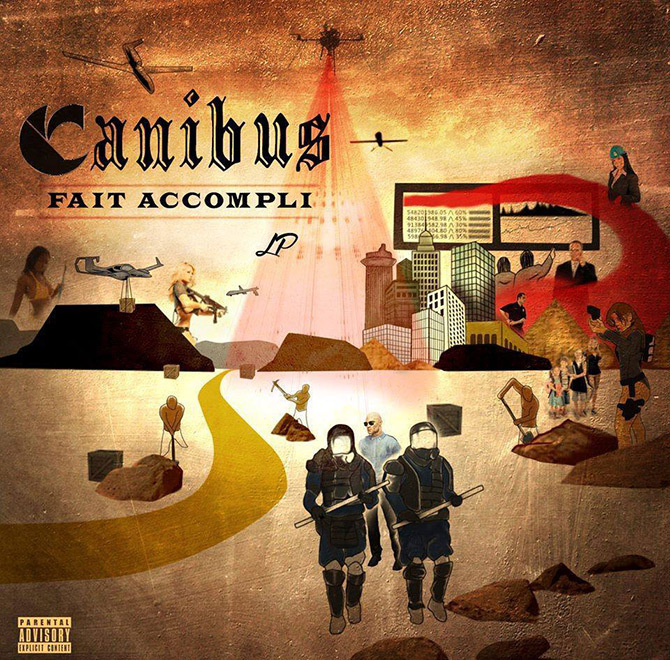 Heavily reinforced by guest speakers, but far from lacking in substance and depth, Canibus paints his tracks with recordings of impassioned and almost crazed narratives warning of an impending cataclysm. Bis’ trademark lyricism almost seems to contrast and yet not discount these borrowed perspectives, as though he’s grown from a boy in his freshman albums, to a man, and now to a man of renown. It’s a curious and unique cocktail, possibly intended to allow an interpretation of his music to resonate differently for each listener’s own social perspective. The phrase Fait Accompli seems to resemble the title of a chapter, the tale of the end of modern history as we know it, or at least the 11th hour of it, and told from a perspective that is not his own. If it is too late to change history, then Fait Accompli is an invitation to observe rather than resist. As only Canibus can, the title also aligns symbolically on multiple levels personally with the artist, as this is Canibus’ own 11th hour release; his final project, Rip the Jacker: Infinity is drawing near.